Look, it's the sensational character find of 2012, Marvel's Ex Nihilo! Don't feel bad if you, like Korath the Pursuer in the video clip up there, don't know who Ex Nihilo is. He was created in the "Marvel NOW!" iteration of Avengers, where he was a member of The Gardeners, creatures created to help shape life in the universe. He terraformed Mars, and tried to do the same thing to Earth, but was stopped by the Avengers. You don't really need to know any more, other than that he was basically a walking plot device to help set up 2015's Secret Wars crossover. His purpose fulfilled, he was summarily killed off right before the event began, and immediately became a minor footnote, a piece of trivia to be forgotten until some future writer feels the need to redeem/reinvent him. The circle of (comicbook) life! That said, Ex Nihilo definitely makes for a unique-looking toy on your shelf. 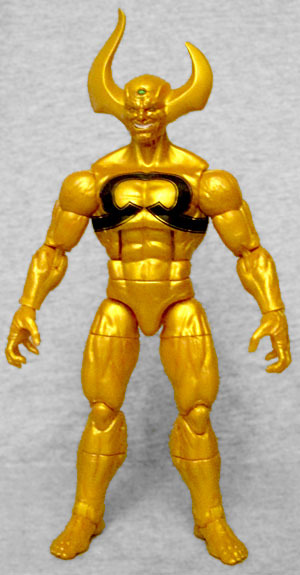 He gets the big body, and it's almost entirely gold - the only divergence is the big stylized Ω painted in black on his chest. 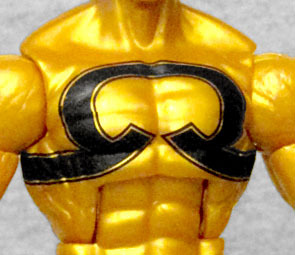 It's matte, compared to the rest of the figure's gloss, and ends under his armpits, just as it does in the comics (I would have thought it continued all the way around, but I would have been wrong). He has large asymmetrical horns on his head, and while we've seen these clawing hands before, the bare feet are new. Unexpected! 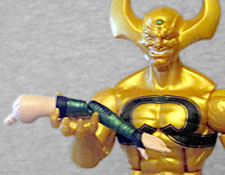 The big stupid "Goldverine" horns aren't the only interesting feature on Exxy's head, thank goodness: the entire thing has a very crisp, detailed sculpt, with ridges that almost look like seams, and a third eye in his forehead. He's got a big smile, because he loves his job, and the sculpt looks a bit like character actor Shea Whigham (a "hey, it's that guy!" guy). While Ex Nihilo (whose name comes from the Latin for "from nothing," appropriate considering his power to generate life) has all the usual ML articulation, my figure also had something rare going on: stiff, stuck joints. It's not all of them, but the hips in particular were nearly immobile, both the balljoints themselves and the swivels at the top of the thighs. Maybe it's something to do with the golden plastic used? Or maybe it's just a quirk of my sample. Either way, it took nothing more than a little pressure to get them moving. Exmus Jaxon Flaxon-Waxon has no accesories, because he's more of an "energy attacks" character than a "physical attacks" character. And because he's such a big dude, he gets a small piece of the Build-A-Figure: Mantis' left arm. Ex Nihilo was created by Jonathan Hickman and Jerome Opeña, a fact we mention because it means there were probably at least two people in the world who were looking forward to this action figure; for the remaining seven and a half billion of us, though, he's just the thing you have to buy if you want to finish the BAF. Thanks, Amabo!